The first part of my trip was about leaving, and saying goodbye. A group of 30 friends followed me to the Dutch/Belgian border before I continued through old home territory in Aachen and Cologne. As the kilometres passed, the territory became less familiar, leaving the last known territory after Giessen. Germany was about visiting friends and meeting new warm shower friends. Germany and the Netherlands have been my home over the last 21 years. I will miss them. Day 1. 87km. Eindhoven – Schimmert.The day was surreal. Escorted by a mass of friends to the Belgian border, we sat in the sun, fearing the moment of our ways diverging. Then welcomed by more friends on arrival in Schimmert – with the Dutch flag and a glass of champagne. I still haven’t fathomed everything. That will come. Day 2. 36km. Schimmert – Aachen: The pressure and stress of the last week was released like air escaping from a balloon. A short ride through familiar territory with Ed and Frank to Aachen before a relaxing in the beautiful thermal baths in Aachen. Day 3. 87km. Aachen – Köln: An eery silence standing above the empty freeway, a lone bird squawking in the distance. Standing under the ever impressive twin peaks of the Cologne cathedral, waiting for the journalist to arrive. And catching up with old friends, in Aachen and Cologne. Kölle Allaaf! Day 4. 42km. Köln – Bonn: Today was a day with friends in Bonn with a short ride in the sun first to get there. Talking, eating, walking, haircuts, and collecting a new webcam in Bonn. Day 5. 74km. Bonn – Koblenz: Cycling through the sun with Dirk Tenhündfeld. We climbed the Drachenfels and rolled along the Rhein – Dirk on a heavy public rental bike. The sunset in Koblenz was amazing. Day 6. 76km. Koblenz – Limburg: I woke to rain, and the rain remained looming all day. But the sun poked out too as I cycled along the beautiful Lahn valley, endowed with steep wooded sides and pretty villages. Day 7. 82km. Limburg – Gießen: A grey day in the Lahn valley. Cycling on through the mist, rain and cloudy skies. The sun arrived in Gießen, where I caught up with my friend Mathias. We had a lovely evening chatting. Day 8. 103km. Gießen – Darmstadt: Thunder and lightening in the distance. Around me were rolling hills shrouded in mist, and a long, straight, flat road. In Frankfurt was a fair on city planning and mobility. In Darmstadt, I am staying with a bike city planner. A real bike infrastructure day. Day 9. 84km. Darmstadt – Heidelberg: The famous route through the ‘romantic’ tourist villages – the ‘Bergstrasse’. I cycled half of it with Benjamin, while he checked out the status of the bicycle path signage.. Then the heavens opened and rained on the runners in a triathlon, the connoisseurs of the wine tasting event, and little old arctic-cycler. Day 10. 84km. Heidelberg – Heilbronn: After a dry start crossing rolling fields, the heavens tried to outdo their effort from yesterday regarding downpours – and they succeeded. Marius – my warm shower host – is preparing for a world cycle trip. I love the twinkle in his eyes. We are both about to experience it. Living on the road. Day 11. 106km. Heilbronn – Ehningen: The long way from A to B is best. I am not used to taking time on bike trips, and am slowly learning this new art. On the wide curves of the Neckar River are the most amazing vineyard views. And, as the day proceeded, the sun emerged, bathing them in a beautiful light. Day 13. 113km. Ehningen – Schömberg: A day extra before visiting friends in Meßstetten. I’m really in purple cow Milka territory now. Pine covered steep hills, and green fields. I can’t stop thinking of the alps in Switzerland. Due to a miscalculation, I find myself in a camping ground just 20km from Meßstetten. My plan of cycling a bit along the Danube before Meßstetten will be challenging. Day 15. 110km. Meßstetten – Konstanz: Goodbye Inge, Stefan, Jan and Jonas in Meßstetten. It was great to see you again. 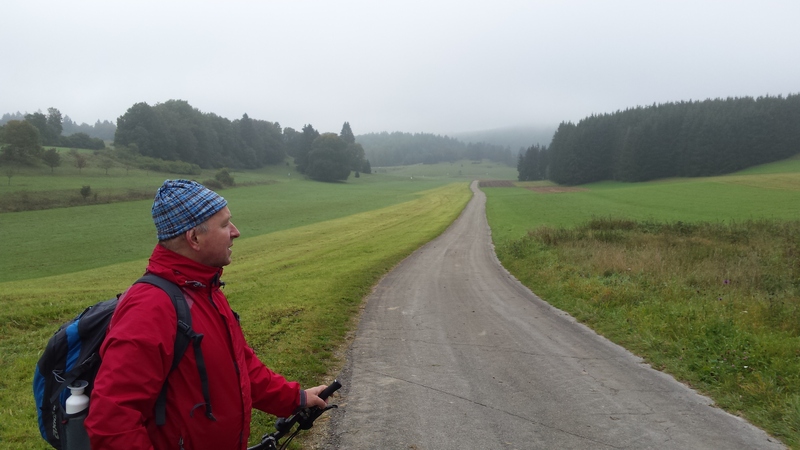 The mist in the Schwäbischen Alb dissolved as Stefan and I rolled downhill to the Danube valley, and further across green fields and forests, following little streams on their way down to the Bodensee at Konstanz. A beautiful sunny cycling day!